JK Rowling hired Amanda Donaldson to help organise her business and personal matters. He said she was suspended and later dismissed in 2017 over alleged unauthorised spending that also included ?2,139 in stationery shop goods from Paper Tiger and more than ?1,800 spent at Starbucks and Costa.His wife claims Ms Donaldson wrongly benefited to a total value of nearly ?24,000Dr Murray said the biggest concern was over cash withdrawals of ?400 and ?250 in December 2016 that Ms Donaldson claimed were for a Christmas lunch deposit.Chartered accounted Steven Simou had earlier told the court that he had contacted the restaurant involved and found no deposit had been requested or taken off the final bill. Dr Neil Murray said he was "really taken" by how good a liar Ms Donaldson was. Dr Murray said he had then challenged Ms Donaldson in "an astonishing encounter".He said: "Amanda had always adopted a lively, slightly bubbly, a bit scatty demeanour. "I thought she might be emotional or run about the office looking for bits of paper, but what I found was a completely different personality. "She shut down, was calm and basically lied. At the end of the encounter I was really taken at how good a liar she was." 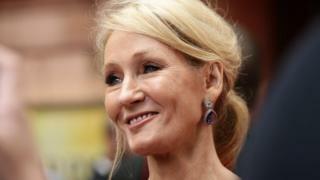 The author's husband said there was a small staff of four full-time and two part-time workers who shared an office with Ms Donaldson in Edinburgh.Asked by JK Rowling's solicitor, Kathleen MacDonald, if there was any reason for the ?3,629 spend at Molton Brown, Dr Murray said: "Well not for the office, it doesn't make sense. "I think the vast majority was purchased by Amanda for Amanda." Dr Murray said there was "no question" about what the credit card was meant to be used for. "This was a business card to facilitate my wife's business life," he told the court. He added: "I heard from office staff there was an occasion Amanda was out socially with staff and they bought pizza. "Amanda offered to pay for the group and took out the business credit card. I was told she said 'don't worry, Neil doesn't check this card'. "Accountant Steven Simou earlier told the court that a safe, which Ms Donaldson had access to, was found to be missing more than ?7,700 after she was suspended.The accountant said he had analysed the credit card account after a concern was raised by another member of staff.He said: "I was just quite shocked to see so many expenses there, clearly not of a business nature. "He added: "Certain expenses stood out more than others - Costa, Starbucks, bakeries, Boots and other high street shops you wouldn't normally associate with a business spend. "Cross-examined by Amanda Donaldson's lawyer, Mr Simou acknowledged that he did not know what instructions she had been given for using the card.The civil case before Sheriff Derek O'Carroll continues.